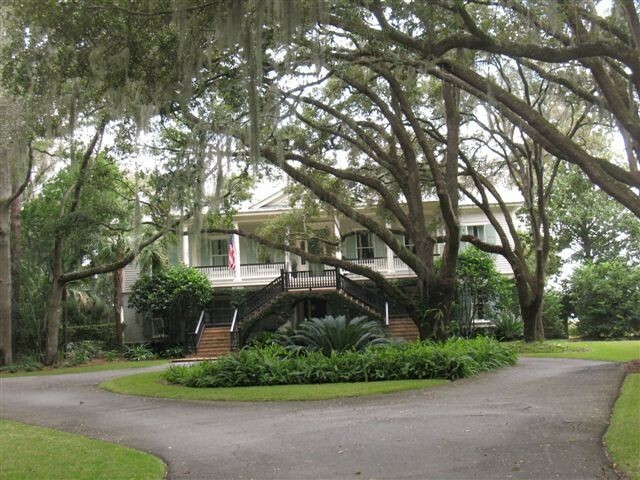 Ancient live oaks surround this low country plantation-style home located on Dunbar Creek. 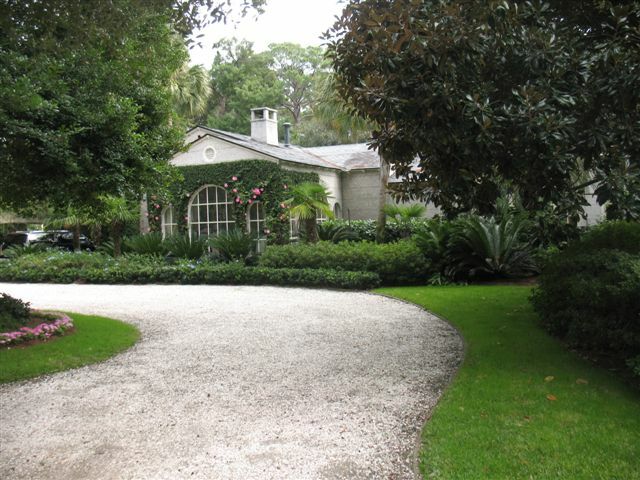 The home was built on what were once the formal gardens of an old plantation and the exterior views are stunning. The home’s interior is equally spectacular in its own right, designed by Biggs Powell of Memphis and Charleston. The design is all about attention to detail, function, comfort and the collection of items with special meaning to the family. You will want to move slowly through this home as there is much to see. The owners are avid readers and the study features signed pictures of favorite artists as well as antique soldiers and other collectibles. Books are everywhere and share space with extraordinary art. Note the collection of both drawings and paintings by the late Carroll Cloar, depicting stories from his childhood in the Mississippi Delta. The homeowners purchase what they love as they travel and some of the special finds you will see are Sanskrit manuscripts from Southeast Asia, a kuba cloth from Tanzania, an antique French kayak, and so much more, with one find more interesting than the next. The downstairs section of the home is all about family history and relaxation. The homeowners have a lifetime of memories visiting the area, including a honeymoon at the Cloister fifty years ago this August. Pictures from those visits fill the family room and progress by time around the space. The downstairs walls were hand-painted by the couple’s daughter-in-law and also feature more interesting art and collectibles from travel and family adventures. Directions: Take Frederica Road north. Turn left on Sea Palms West. Turn left at the next stop sign, staying on Sea Palms West. Continue straight through gates marked “The Enclave”. Above all, this is a family home made to be lived in. Designed and built in 2010 for the homeowners by Architects of the Harrison Design Group, builder Rob Marrett and interior designer Liza Bryan, the house is centered around the needs of a busy multi-generational family which includes ten young grandchildren. The result is a comfortable residence built with both new and antique materials blended in French Country flair. It’s uniquely livable and also takes advantage of its lake-front location. The first floor is perfect for entertaining and family activities. The foyer welcomes you with a Swedish antique clock and player piano. The entertaining rooms are full of beautiful and interesting furnishings as well as striking natural materials. The views to the lake are spectacular and are enjoyed from virtually every room in the home. Note the heart pine floors reclaimed from a warehouse in New York and the oak beams reclaimed from an Amish barn in Ohio. The murals in the guest room and on the staircase were hand-painted by local artist Josie Kennedy. Antique furniture pieces with personal historical significance are found throughout the home, such as the shipping container taken from the general store in Virginia owned by the homeowner’s great, great grandfather, an old church pew from a Baptist Church in Henderson, North Carolina, and a Victorian dresser which was a wedding gift to the owner’s paternal grandparents. The second floor features wonderful views of the lake, perhaps best enjoyed from the outdoor porch. There are also separate bedrooms specially designed for girls and boys and a media room complete with refurbished arcade-style video games. Down stairs, the chef's kitchen features built-in appliances and ceilings of reclaimed river cypress. The owner’s desire to incorporate the kitchen into family space is exemplified by the lack of overhead cabinets and the use of pantries. There is also a French courtyard off the kitchen as well as a wine cellar and media room. The media room features a billiard table, game table, golf memorabilia, as well as antique posters from the family’s old general store. Outside areas are also focused on entertainment and feature a fire-pit, sleeping porch and pool with citrus garden. Every part of the home, outside and in, is used as a beautiful lake-front refuge for the entire family to enjoy. Directions: Take Frederica Road north towards the round-about with Lawrence Road. Travel north on Lawrence Road from the round-about. Turn left into Frederica onto Pike’s Bluff Drive. After passing through the Frederica guard gate, turn left onto Pike’s Bluff Road. Cross over three bridges. The home is on the right after the third bridge. Tuscany was the inspiration for this new home in Frederica. 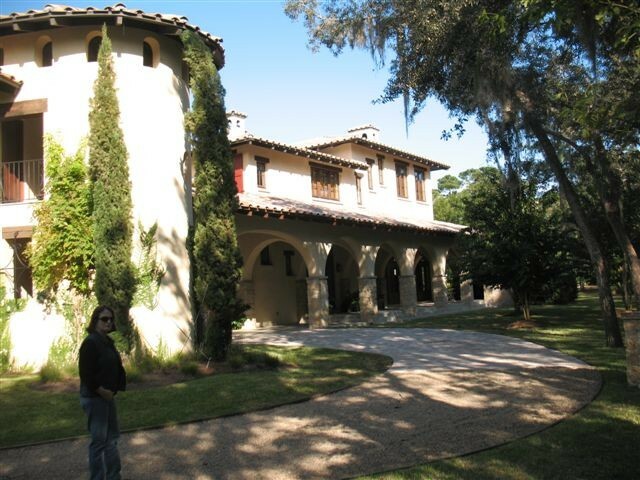 The architect designed the home using characteristics of a Tuscan farm house such as repeating arches, coved and vaulted ceilings, Roman cap and pan roofing and long vistas of light. The result is luxurious privacy, quiet beauty and serenity as if set in the Italian countryside. The look is brought together with use of exquisite materials. The foyer features antique reclaimed terra cotta floors and one of several Richard MacDonald original sculptures found throughout the home. The stairway featuring hand wrought iron work leads to a study, common room and two bedrooms upstairs. The study is full of interesting sports memorabilia and features a desk hand-made in Italy of antique wood, wide plank heart pine floors and a cypress ceiling and beams. Back downstairs, you will visit a brilliantly-designed and beautiful kitchen. The kitchen can be separated into preparation and entertaining areas by use of a large pocket door. The surround for the cook top is made from ground marble in the ancient Scagliola technique. There is also a fireplace in the wood beamed kitchen and in the adjoining wine cellar and tasting room. Note the barrel-vaulted ceiling in the tasting room, made from brick reclaimed from a turn-of-the century Chicago warehouse. The French Corton stone floors have distinct purple vein coloration because they were quarried from under a vineyard. The main salon has a Scagliola fireplace, Venetian plaster walls and floors of Jerusalem gold limestone complete with fossils visible in the stone. The master suite features more reclaimed wood, coved ceilings and a beautiful stone medallion the homeowners found on their travels. The exterior spaces were also carefully considered. There is a Tuscan-style herb garden as well as two large intersecting logias complemented by a spa and pool, and a screened summer kitchen with stone fireplace Guests enjoy these beautiful spaces as well as their own separate quarters just off the logia. Directions: Take Frederica Road north towards the round-about with Lawrence Road. Travel north on Lawrence Road from the round-about. Turn left into Frederica onto Pike’s Bluff Road. 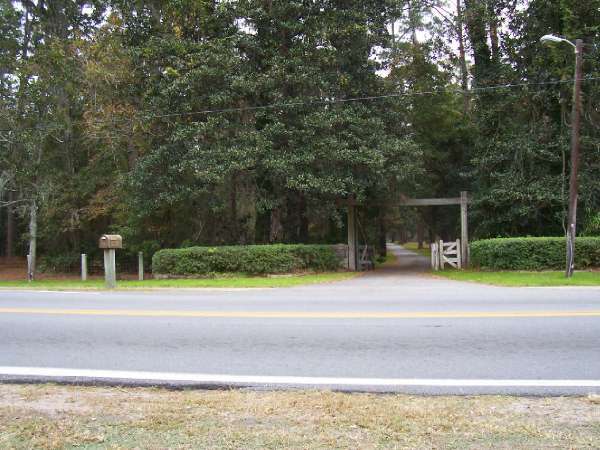 After passing through the Frederica guard gate, stay straight on the mail entrance road over two bridges. After the second bridge, turn right on St. Annie’s Lane. The home is on the right. The Village Creek Cemetery lies on the east side of the property where only the descendents of slaves are permitted to rest along with their ancestors. Mrs. Reynolds passed Musgrove Plantation down to Smith Bagley, her son, and Mr. Bagley was given special dispensation by those families to be buried at this historic site upon his passing in January 2010. A Nantucket-style kitchen, a spa-like bathroom, and a curvy, open balustrade add up to casual cottage style and Sea Island living at its very best. Designer Jim Howard collaborated with architect John Rentz on the interior and Skip Russell did the renovation. The architecture and décor is a mix of old world and new, with fascinating detail and views that bring the outside in. Elegant architectural details begin just inside the front door. The home was originally built in the 1930s and is open and livable, perfect for both family life and entertaining. The living areas are beautifully appointed and strike the perfect balance between style and practicality. Although the house's exterior is Spanish Revival, the owners wanted a clean-scrubbed Nantucket-style kitchen. Counters and the wire-brushed oak island are topped with a beautiful milk-white slab of Italian marble. Floors throughout the home are of fumed oak, specially treated to bring out the grain of the wood. The wide upstairs and hallway lead you to a master bedroom with vaulted ceiling and porch. The master bath features gleaming basket-woven marble and the entire master suite enjoys beautiful views off a private porch. There are additional guest bedrooms both upstairs and down, each decorated with charming fabrics and collectibles. This fun, colorful cottage is full of charm. Designed and built in the 1940s and renovated in the last decade, “La Belle” is styled as a beach cottage, just a couple of houses off the ocean on Sea Island. Local interior designer Mary-Bryan Peyer and Atlanta-based designer Jackye Lanham, masterfully mixed soothing beach colors and creative designs. Pink and white are combined with shell, mirror and mercury glass in accents, furnishings and window treatment that are traditional, but with a twist. The smart combination is bright, lively, and delightful. The main house is for entertaining and for the comfort of the homeowners. The welcoming entry opens to a light-filled dining room. The spacious living room has two beautiful focal points with the grand fireplace and custom armoire showcasing large specimen shells. Be sure to notice the kitchen tabby countertops and fanciful cabinetry and window treatments. Throughout the house, the pecky cypress walls and floors are painted a soft white. It is a fun and inviting space, perfect for a couple who wants to both relax and entertain. The guest house is guaranteed to pamper travelers in their own quarters. This special space features three bedrooms, including a sleeping loft. Where the main house in designed with feminine and calming tones, the guest house’s fabric and furniture choices are all about fun and comfort for lucky guests. In between the main and guest house, enjoy the pool and courtyard. This tour stop is as charming on the outside as it is on the inside and you are going to love this storybook home from start to finish. This classic Federal-style home features an old world feel. It was custom-built by the current owners and has been lovingly maintained by the family over the years. It is a beautiful mix of modern appointments in a classically designed and decorated masterpiece. You will appreciate the antiques and formal floor plan, while also feeling the love and comfort that inhabits the home. The house is large with five bedrooms, five full baths, and two half-baths. You will enter into a formal foyer with a winding staircase and crystal chandelier. The dining room is next and has beautiful antiques showcasing fine crystal and china. The light, bright living room with fireplace and wet bar overlooks a heated pool and beautifully landscaped backyard. The chef’s kitchen has an antique-reproduction island and custom cabinetry, Star Breeze granite, and a Viking stove. There is also a copper sink and light fixture from Mexico. The Portuguese tile was hand-picked by the homeowners on a visit to Portugal. Their love of animals is present in the many accessories found in the kitchen and throughout the home. A beautiful formal feel is continued in all the bedrooms and there are master suites both upstairs and down. The home also features generous shaded porches and sunny terraces. It is a celebration of traditional décor, complete with beautiful furnishings and fine finishes throughout. This magnificent new home, overlooking one of Sea Island’s salt water lagoons, offers a lovely, peaceful panorama of the water. Designed by the discerning homeowners in close coordination with local builder and master carpenter, Jim Redden, the home is made of the best materials and was inspired by the reconstructed Cloister Hotel. It’s located just a short walk from both the beach and the marsh, and enjoys a lovely sea breeze in even the hottest of summer weather. The spacious home is steeped in casual elegance and meticulous attention to quality and detail. Local interior designer, Linda Lindsey, assisted with the selection of finish details, colors and fixtures throughout the home. Perfect for multi-generational gatherings, Cottage 548 includes first and second floor master suites with an additional second floor game room, media room, family room, exercise room, office and two spacious bedrooms. Both master suites feature covered porches with lagoon views, and all bedrooms have large bathrooms with ample spa-like features. Also great for entertaining, this cottage includes a large family kitchen and a separate caterer’s kitchen. There are interesting and beautiful ceilings throughout the home, as well as pecky cypress paneling and wainscoting in the kitchen and first floor family room. An outdoor grilling center between the main house and guest house overlooks the pool, spa and lagoon. Fully equipped guest quarters, located over the garage, enjoy splendid view of the pool and lagoon.